This three-bedroom designer villa in Umalas takes the wow-factor to another level. Beautifully combining sleek design with traditional architecture, Villa Gambar is a top choice for a family or a group of friends looking to experience Bali in style. Located in a quiet cul-de-sac, you’re within minutes’ drive from some of the trendiest coffee places and eateries in Seminyak and Canggu. The living and dining areas were designed with great attention to detail and a loving eye for stylish design. Filled with unique pieces of traditional Asian art, colourful modern furniture and the typically Balinese playfulness that’s on display throughout, villa Gambar has a really unique depth and atmosphere. The dining table comfortable seats six people and there’s a large sofa with additional arm chairs which are great for lounging around. The villa’s clever layout also allows for plenty of additional seating and little hideouts both indoors and outdoors. The three bedrooms have their own unique character. Each comes with air conditioning and large semi-outdoor ensuite bathroom. One of the bedrooms has two single beds which can be turned into a double, while the other two bedrooms have queen-size beds. 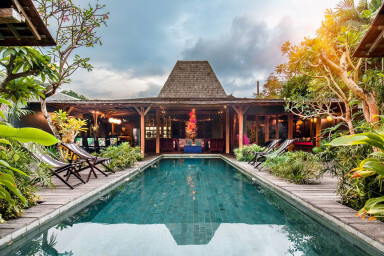 Villa Gambar is built around a lush tropical garden and a generous private swimming pool. By day it’s the perfect spot for relaxing in the sun, while by night it provides the glamorous backdrop for evening cocktails and night time stargazing. The fully equipped kitchen comes with all mod cons. It has a granite worktop and a large kitchen island with bar stools. We’d very much recommend you let our private chef take care of the cooking instead, so you can focus on fully enjoying your holiday. At an additional cost she’ll prepare you the most delicious daily breakfasts, lunches and/or dinners. She’ll also gladly throw in a little masterclass in Indonesian cooking – perfect if you want to impress the crowd back home. We had a great time at Villa Gambar! Everything went so well, from pick up to everybody's to the activities thar we did (bike And tired top with The kids was so perfect). We will be back! The villa GAMBIAR is nice and well equipped but far from the beaches. It"s located in a small street and gave a good first impression. We rented it for 6 nights. Impossible to sleep due to dogs barking the whole night. We asked the owner's assistant, the second day, if he could do something but after 4 nights we decide to take a room in a hotel for one night. When you stay at the swimming pool your hear another dog crying because the owner is not at home.